Small nanoparticles result in great features, that much we have learned since the tiny bits were discovered - from drug delivery systems to water-repellent nanocoatings, and its the latter we are interested in because of its huge potential to protect our smartphones and tablets from various liquids, but mainly water and beer. 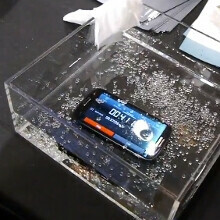 P2i had the newest generation of its water-repellent nanocoating on display at the MWC 2013 expo that allows you to actually submerge a Samsung Galaxy S III or any other phone under water as is, and was nice enough to demonstrate its features for us. The great part is that the 1/1000th of a human hair coating is invisible to the human eye, and doesn't change the look and structure of the object it is applied to, like a smartphone, but makes it impermeable to water. The rep mentioned they are working with Motorola and an "European manufacturer" to make their phones water-resistant with the last-gen P2i tech, which we only hope he meant Nokia rather than Alcatel, for instance. Check out the cool demo below, and don't worry, once this thing hits all handsets, you can freely drool over them. oh yeah and also the time under water...xperia z is supposed to stay 30 min under water and the guy said over 4 hours or till the battery fails. ok man..dont freak out about you "super phone"...this is a water test, nor dust or scratch test...i said things about the "water test"...the guy didnt say anything about how deep the phone can go...sony claims 1 meter, ok...this is a coating, also ok, but, they're gonna put it in a mass production, no matter what device and the Z is just one and thats the advantage the kostas12ldb was talking about..the most impressive of the XZ feature, for me and many people, was the water resistant feature in a beautiful design, which is gonna be made by other companies in a easier way no matter what design is. So. Cool. I think battery life is my most desired feature outside of form factor but water proofing is really cool too. With this kind technology, it almost seems irresponsible to not use it. I cannot say just how much I dig this tech. i still don't understand how it works. do they coat all the holes in the device? how about the usb/charging port? how did it protect the removable back cover of the s3? does it not affect the removal/reattachment of the back cover? amazing tech. quite expensive though. i don't think samsung would want it. they're selling well enough without the waterproofing. not unless they can see an xperia sales surge which i doubt will happen (but i hope does). It's like Liquipel tech, and I think Liquipel did it first. IDK, not sure. you put the item (phone) into a chamber and do a vacuum then fill the chamber with the waterproofing substance and that coats everything, including all the internals. I dont know about P2i's service, but Liquipel's waterproofing is almost on the way for local service because they essentially made a smaller version of their machines for local services (YES, going to a stall near you! SOON I HOPE). Why can't he take out the phone and dips it in again? And how long does the coating stays on? I hope this comes on the Moto X! It is Alcatel (OT-997 and OT-992). How does the water not get in though the speakers and microphones and the connecting slots? so basically what we have here is a linex/rhino lineing or whatever else u want to call it for cell phones instead of truck beds! wow!amazing! if Sony xperia z only got the HTC one Specs that would be the BEAST smartphone! and probably my next phone.. The "liquid" looks more like mineral oil instead of water. If it is mineral oil, then no wonder the device is still working.